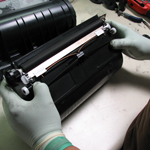 How Are Remanufactured Toner Cartridges Recycled? 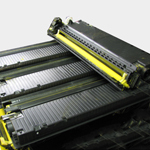 | TonerGreen - Eco-Friendly Toners from the U.S.
How Are Remanufactured Toner Cartridges Recycled? All materials are individually inspected and verified against strict standards. Inspection is especially thorough for empty toner cartridges. The inspection involves a visual inspection of dents, scratches or sign of too much strain. Components are also inspected for conformity to industry standards. When a toner cartridge is no longer viable but its parts are still useable, the toner cartridge is dissembled and recycled. The components are then sorted in the OEM raw materials bin and will be used in the remanufacturing process. 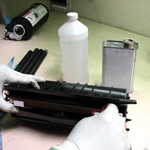 Empty toner cartridges are carefully disassembled and split. 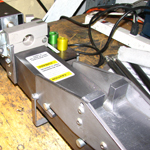 The cartridge is split using a custom splitting equipment to preserve the integrity of the cartridge. The toner cartridge is methodically cleaned with industry-approved cleaning solution to remove residue and alien particles from the components. If the cartridge is using recycled parts, the parts are individually cleaned, as well. 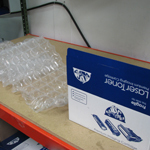 Using an automated filling equipment, each cartridge is precisely filled to the exact specified weight. Toner hoppers are filled with premium toners, which are technically matched to the OPCs (drum) for optimal yields and printer performance. The toner hopper (the cavity in the cartridge that contains the toner powder) is sealed to create leak-proof cartridge that is easy for the consumer to install. We use only industry-recognized and patent-conforming seal process. 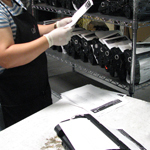 Our factory-trained technicians assemble all cartridges both with compatible components and used OEM materials. The assembly process includes the installation of a pre-qualified drum (OPC), wiper blade, doctor blade, PCR, magnetic roller, and smart chip. True to our commitment to environmental preservation, we strive to maximize the use of recycled components from 39% - 75%. Each cartridge is post tested based on industry standard print tests to ensure outstanding performance and OEM-comparative print quality. Each step in our manufacturing process is monitored by dedicated quality control technicians. Each step in our production process undergoes regular and spot inspections to guarantee consistency and conformity to the company-approved remanufacturing process.